The original Big Bang Theory is a scientific hypothesis that explains the origin of the universe. Lipstick Queen’s Big Bang, on the other hand, is a line of glosses designed to create the illusion of fuller lips. These glosses don’t include any stinging, itching “plumping” ingredients; instead, they give the impression of fullness through color and light effects. Inside each of the Big Bang see-though containers, which look like test tubes from some very beautiful laboratory, you can see the “futuristic formula” of this gloss. It has a gleamy, iridescent finish without any detectable particles of shimmer or glitter. This is the kind of sheen you see more often in high-end nail polishes, or in nature: in mother-of-pearl, for example, or on a hummingbird’s feathers. All the Big Bang shades are tempting to the eye, but I limited myself to purchasing two. Cosmos (third from the left in the photo) is a “glittering cherry red.” It’s a true red that reminds me of Chinese lacquer or ruby slippers. It looks sheerer on the lips, without losing its luster or its depth. I’ve been using it alone, and sometimes over a swipe of Lipstick Queen’s Medieval, and I’m working up to trying it over a more opaque red or berry lipstick for a more dramatic look. Creation (sixth from the left) is defined as a “sparkling rose.” It’s a slightly cool-toned, medium pink with a dreamy pearly cast. This is my newest favorite lip color for everyday use. I’ve been wearing it on its own, for a soft, springtime glow, or as a second layer to give my Minor Crisis Oxymoron or Saint Rose lipstick some extra brilliance and intensity. On the lips, Big Bang Illusion Gloss feels satiny, without any stickiness or slipperiness, and it gives a luminous tint without an overly “wet” appearance. This is a sophisticated way to wear color and shine; you could even say it takes lip gloss into a new dimension. 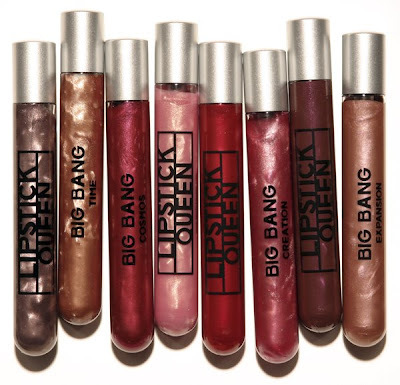 Lipstick Queen Big Bang Illusion Glosses are sold for $20 each at Barneys New York and through the Lipstick Queen website, http://www.lipstickqueen.com/. Product photo courtesy of Lipstick Queen. 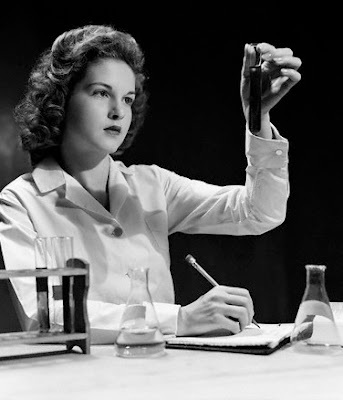 Photo of a student nurse by H. Armstrong Roberts (1947), via Corbis. Jessica, your review is great! And you chose two beautiful shades! By the way, what type of applicator is inside, is it a sponge tip or a brush? I can see why Poppy would name these Big Bang...the Big Bang model purports that all matter expanded from a hot, dense ball and continues to expand to this day taking all the galaxies with it. With matter moving outward, our universe was created via the rules of gravity which causes our solar bodies to stay attracted to one another. Looking into the mysterious fluids of Lipstick Queen's Big Bang, I imagine I can see matter swirling and glossy wonderfulness waiting to be attracted to my lips and make life on my lips shiny luscious perfection! Patti - Applicator is a sponge tip. I have this in Cosmos and I love it. I too have been layering it over the Medieval lipstick. I recommend layering it over Berry Sinner. I love this much better than The Lipstick Queen's Shine Glosses. Those are too sticky for me! I like the vintage photgraph on this post! Hmmm, anyone seen Energy IRL? Since I can't seem to wear red lippy, I thought I might try a gloss and this one appeals. Well, you've done it again. I went and purchased Infinite and Time. I have never seen gloss that looks like this and I hae been around oceans of the stuff. Cavewoman tells me these are freakin' awesome...who am I to argue with such wisdom??? <3 the test tube looking containers. Hi Shoeho, You could always start with LQ's Medieval and the Cosmos gloss, like I did; it's hard for me to wear strong reds, but both of these work for me! FBgrl , the gold shades look amazing, too! And yes, the test tubes are so clever, and even their boxes are too cool to throw out. Poppy/LQ always creates the best packaging for her products! Just to say : nice blog and articles. I love the fashion and the trend you set ! Shopinchic, Do those plumping-puffing lip "venoms", etc., really work? I've been too scared to try them. They sound like they would cause some slight damage (drying? )in the long run. Mode, I will pass your compliments along to Annie! Thank you! Can't WAIT to try these on trip to NYC in the Fall. Wish I could go RIGHT now ;].